Some two years ago, Conor McGregor and Floyd Mayweather must have met in some smoke-filled lounge in some back alley off some street in a bad part of some big city we could never guess. They decided to play a game, a zero sum game. They would talk about each other in ways both callous and hilarious. They would meet on a pre-arranged date at a pre-arranged time (delayed for drama because of cable outages in California and Florida) and fight. One man would get credit for doing better than expected and the other would get credit for not being in a boring fight. One would retire with legendary status assured while the other would waltz back into the sport in which he was king and bring with him a fame previously unimaginable. It’s a strange thing in combat sports when everyone comes out ahead. In a sport that trades in wins, losses, and knockouts, someone always has to end up a loser. Somehow, despite McGregor being saved by the referee as he wobbled on his feet in the 10th - some six rounds later than he predicted he would ether the man they call 'Money' - both he and Mayweather 'won'. It seems fitting that after a fight that surprised even the most vocal McGregor acolytes, the spectacle of all spectacles, the cynical fight of our time, was something different than what its parts promised. What that thing was was actually not that great. Conor McGregor, as he always does, came out from the opening bell pressing forward. While Mayweather put up his earmuffs and let McGregor wail away like a man facing a heavy bag with a 49-0 record, each uncontested punch gave the appearance he was more and more competitive. As round one became two and two became three, each minute McGregor stood in with one of the greats of boxing legitimized him. Though McGregor was not getting off his feared left hand with the kind of shots that MMA fans laud, to those fans he seemed marching unencumbered to a finish, regardless. Except, it wasn't that simple. Look no further than the reaction in the booth from the Showtime commentary. The three-man team of Al Bernsetin, Mauro Ranallo, and Paulie Magnaggi played off eachother like a proxy war of the public's expectations for the fight and how it unfolded. The prevailing narrative of the fight became how the severely outmatched man was shockingly competent. Bernstein was the boxing elitist who gave McGregor credit with a laugh. With each comment, he gave the impression that McGregor was amazingly overachieving. You can call it patronizing. He lauded that McGregor’s footwork ‘actually’ looked good and chuckled after every combination the MMA champ landed, because he wasn't supposed to even touch the Pretty Boy. Bernstein was like the droves from the boxing world who couldn't fathom McGregor throwing body-head-body let alone a jab. Ranallo attempted to strike an even, everyman tone but came across as overly analytical. He was downright critical of Mayweather’s persistence at turning his back and, at one point, Ranallo exclaimed McGregor’s illegal hammer fists were simply a ‘reaction’ because he uses them in MMA. Sure, Mauro, I missed how MMA fan have an aneurysm when someone takes a shot to the back of the head. The more he noted that Mayweather was chasing or McGregor was looking calm, the more it felt like his mental gymnastics were soon going to take a devastating plunge off the uneven bars. Shockingly, the one person who had no reason to be rational was the man who saw the fight most clear-eyed. Paulie Mag is one of the few men to stand in a boxing ring with McGregor. No one on commentary had nearly the experience to note what Mayweather was a a better platform to point out what McGregor was bringing to the table. Judging by his commentary, he was on point. Few of McGregor’s flourishes surprised him. He correctly noted how McGregor may have won the first thre or four rounds, but it wasn’t on even terms – Mayweather wasn’t throwing back. If Mayweather was choosing not to throw back, it was with purpose. As the fight progressed, the shots McGregor began landing were in retreat as he began constantly moving backwards as Mayweather applied mental and physical pressure. You wouldn’t have noticed that if you listened to Twitter. McGregor never got the knockout. When Mayweather decided to take his gloves down from his ears and walk towards McGregor, nay, march him down as the Irishman has done so many in MMA, McGregor became the man on the back foot. At times, Mayweather didn't even care to cut the ring. He simply walk directly at mcGregor, forcing the Irishman into pressure situations he was unaccustomed to to, forcing him to throw more than one shot at a time, forcing him to tire. 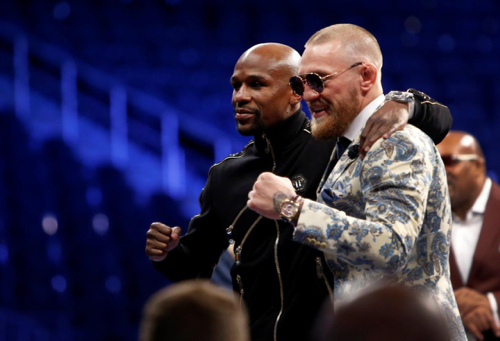 Despite Mayeather letting McGregor have his moment in the early rounds, despite Mayweather than rudimentarily asserting himself over McGregor in the second half of the fight, the fight exceeded expectations. In hindsight, the reaction proved just how low the bar was. Those with delirious expectations for McGregor were excited by his performance, (overstating) how competitive he was. Those who were dismissive of the Irishmen, gave McGregor a patronizing credit for actually being able to punch. Of course, this narrative waxed by Bernstein, Ranallo, and Paulie Mags and the public at large ignored that McGregor was always a competent competitor. Of course he would be able to hold his own. Of course he would be able to throw a punch, a combination, and move around the ring with fluidity and grace. That was the starting point everyone ignored and though it never was going to change the outcome, it framed it in a way that allowed McGregor to be a 'winner', in the moral sense. We showed up expecting The Avengers and left pleased we got Iron Man. Those who believed McGregor would put Mayweather away within four came away pleased he was TKO’d in the 10th while those who expected McGregor wouldn’t make it passed halfway give Conor credit for it. Somehow, between those two positions, the feeling is that everyone won. Nothing ventured, nothing gained.